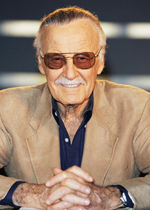 A few months ago we posted the big news that Stan Lee had been added to the guest list for Dragon*con 2010. One of the biggest questions circulating the various Dragon*con forums and sites has been whether Stan Lee would be doing any autographs. Well, we officially know now that the answer is “yes.” However, it seems that his signings will be handled a bit differently than what most fans are used to. Typically, celebrity guests at Dragon*con have a booth in the “Walk of Fame.” For the past few years this has been on the second floor of the Hilton. Sometimes they get their own little room (like Patrick Stewart did in 2009, although it was just down the hall from the Walk of Fame). To my knowledge, there haven’t been pre-sales available for autographs in the past. People stand in line at the convention, and it’s just first come first served, pay when you arrive. For Stan Lee’s 2010 Dragon*con appearance, autograph tickets are being sold in advance, and for a specific day (your options are Saturday or Sunday). Stan Lee is charging $50 for his autograph during this special “Early Bird” sale. There’s no word on whether they will be available “at the door”, and if the price will change. Additionally, you can’t purchase these tickets via Dragon*con’s website. You must go through Desert Wind Comics. You can click here to be taken to the purchase page. Tickets will be available until they are sold out or until Sunday, August 29 at 11:59 pm PST. Oddly enough (and in what seems like a first), the professional photo op is cheaper than the autograph. You can get your photo taken with Stan Lee by Froggy’s Photos for $40. Again, Saturday and Sunday are your two choices. You can make that purchase here. If we hear anything more about Stan Lee’s appearance, we’ll keep you posted. They have since added a regular Friday autograph ticket as well. Seems he’s coming for 3 days now. Also a, very expensive package, on Friday. You get a meet & greet & 2 signed items Friday for $300.